—The matchless and heart-uplifting romantic chemistry between Errol Flynn and Olivia de Havilland. —The rich and vivid look of this many-hued Technicolor fairy tale of the Middle Ages. —The edgy interplay between the unforgettable villains, Basil Rathbone, Claude Rains, and Melville Cooper. —The best Merrie Men ever assembled on screen, most memorably Eugene Pallette as Friar Tuck. —The brilliant script, witty, terse, thoughtful, romantic, and inspiring. —The rousing, Oscar-winning score by Erich Wolfgang Korngold. —That final climactic battle and duel in Nottingham Castle. Many 55-gallon drums of ink have been spilled praising, analyzing, dissecting, and interpreting this film, for which the word “classic” almost seems to have been invented. I’ll just mention a few things you might not have heard or considered. For a film that was perfectly cast, it’s curious that the initial choice of director was not as on-target (archery reference intentional). William Keighley, who had directed Flynn in The Prince and the Pauper, sat in the director’s chair for the first half of the movie’s extensive shoot, but he turned out not have a knack for handling large-scale action scenes, which were necessary in a film intended to evoke the spirit of predecessor Douglas Fairbanks, Sr. So halfway through production Keighley was replaced by the more versatile Michael Curtiz, who had also directed Flynn before (in Captain Blood). It was Curtiz who helmed the fights and chase scenes, the arboreal antics in Sherwood Forest, and the battle in the castle. Then there’s Erich Wolfgang Korngold’s personal tale of involvement with the film. An Austrian Jew, the famous composer and his family were natives of Vienna, where in early 1938 he was engrossed with completing a new opera for performance later in the year. But the opera was postponed, so when the call came from Warner Bros. asking him to do the music for Robin Hood, Korngold was unexpectedly available. Shortly after he arrived in Hollywood the news came from Vienna that Anschluss was imminent, Hitler’s merger of Austria into Germany. Korngold instantly sent for his family to join him, and they got out of Austria on the very last train before travel for Jews was interdicted. It was a daring escape for his family, and poetically appropriate for the composer to a film about resistance to tyranny. 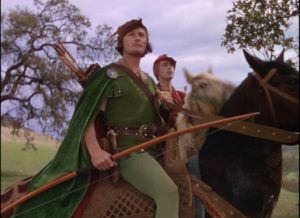 Thereafter Korngold always said that his and his family’s lives had been saved by Robin Hood. Back to the movie: you know those guys who looked like they got shot in the chest with arrows? They got shot in the chest with arrows. Each wore a chest plate of metal to stop the arrow, covered with a slab of balsa wood so the arrow would stick. A $150 bonus compensated for the risk, pain, and shock. Our final fun factoid involves “Golden Cloud,” the horse ridden in the film by Lady Marian. Another Hollywood character, Roy Rogers, was so taken with Golden Cloud’s looks and obvious intelligence that he made inquiries, and eventually bought the horse from Warner Bros. Rogers took Golden Cloud over to the Republic Pictures lot, renamed him Trigger, and made him the most famous horse in Hollywood. Now go watch it again. You know you want to.